Writer Emma Ng discovers the long and considered journey that has led to the creation of Lineage. To those who have not encountered Jennie Loo, Lineage may seem to have emerged from nowhere - one of many new boutiques in Britomart’s Pavilions. Confidently taking its place in the developing Britomart precinct, Lineage is a fresh face in a fresh space, presenting a curious selection of fashion objects - footwear, garments, accessories, and design publications. What lies out of sight is the long trajectory behind Jennie’s new concept store, Lineage being the culmination of many years of evolution. A careful coming together of knowledge, experience, and history, the name ‘Lineage’ hints at the boutique’s predecessors - the Ashley Ardrey shoe stores that Jennie owned for two decades. As a fresh incarnation, Lineage plots itself as a point of new beginning - with none of the naïveté of a new kid on the block. This emphasis on quality and enjoyment continues to unfold through the collection on offer at Lineage. While Ashley Ardrey introduced many international labels to its customers over the years, at Lineage the range has been distilled down - seeking to help customers make sense of the noisy abundance of contemporary fashion. Lineage offers a selection built around several core labels, each with a unique history. These are long standing brands whose staying power is dictated by a commitment to quality and innovation. Lineage also sees an expansion of the range to include a small selection of other fashion objects, allowing customers to visualise combinations of a look’s elements. Celebrating a holistic approach to dressing up, Lineage presents a curated selection of garments, publications, jewellery, and other fashion accessories in addition to its range of footwear and bags. Beyond the gratification of beautiful fashion objects, there is a depth of knowledge and sensitivity to nuance which underlies the selection. Quality, construction, and fit are all considerations alongside design and aesthetics, and instore this extends to consideration of how the subtleties of each item cater to varying bodies, postures, and garments. Labels and objects are only the beginning of the story, and Lineage builds on the quality of its range with the guidance available instore. With emphasis on addressing individual needs - such as building on and maximising a customer’s existing wardrobe – the Lineage team’s extensive understanding of fabrics and materials, construction, and wear are a type of knowledge they hope to share and pass on, beginning with their customers. With access to the knowledge needed to make informed decisions, purchases are transformed into investment pieces. Each visit to Lineage is an opportunity to learn a little more, a collection of knowledge growing alongside a slowly expanding wardrobe. At Lineage this all comes together with the aim of easing sartorial stress, instead replacing it with the confidence to play with different looks and enjoy dressing up. 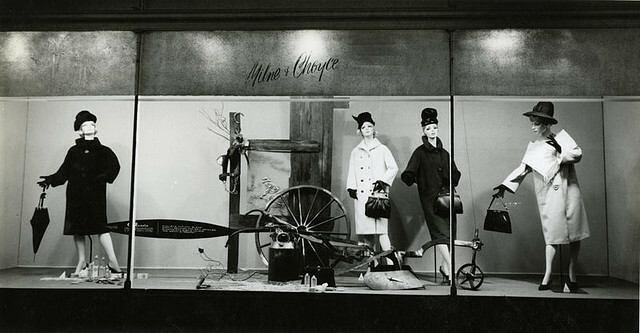 It is this excitement about fashion which Jennie recalls from her childhood - the vitality and spectacle of regular fashion shows at Milne and Choyce, and newly dressed displays in department store windows at the turn of each season. As Auckland city continues to shift and transform, new layers are added to the city’s retail and fashion history. Lineage looks both ways - its commitment to investing in timeless quality and classic style is a nod to the retailers of Auckland past, matched with the impulse to look ahead, seeking out the innovative, the beautiful, and the interesting.